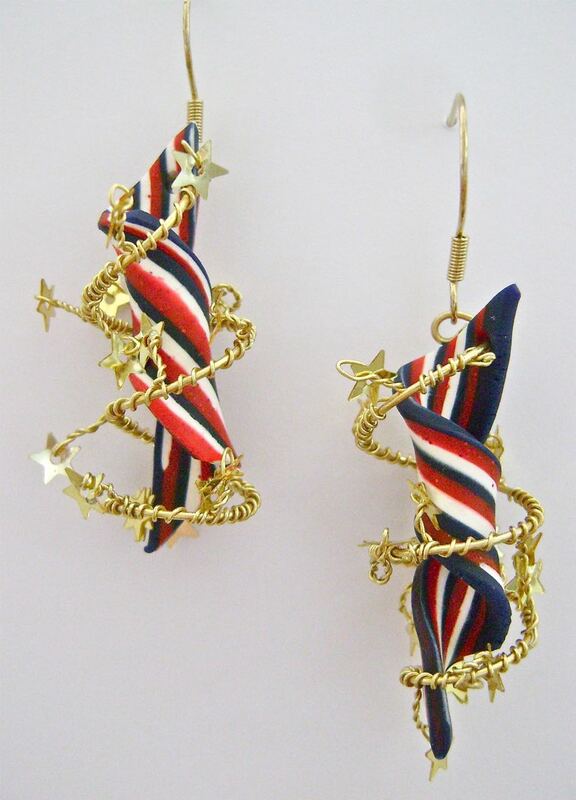 Oh say can you see... yourself wearing these earrings to demonstrate your creativity as well as your American spirit? Broad stripes and bright stars are the theme for this project. The red glitter doesn’t show up in this photo so you can’t appreciate that it shines as bright as the twilight’s last gleaming. The clay stripes dangle inside star-studded, gold spiraled wire. The earrings are two inches long and big on patriotism. Make them for yourself or as gifts. step 1 - With a roller or clay conditioning machine, condition 2 oz. each of glitter red, white and navy blue clay. Roll each to about 1/8” thick. step 2 - Lay the pieces on the work surface with the blue first, then the red, then the white. Slice vertically through the pieces creating thin one inch rectangles. Stack them on top of each other until you have 9 or more pieces stacked. step 3 - Slice through the stack vertically to form a 1/4” slab. Roll it to 1/8” thick. Cut the piece with a blade to measure .50” wide by two inches long. Trim the top top and bottom with an angle cut. Use a Pearl ‘n Etch tool to poke a hole at the top corner. step 4 - Twist the strip loosely to the right. Cut another strip to match. Bake the strips in the oven on a parchment lined baking sheet at 275 degrees for 30 minutes. Allow them to cool. step 5 - Cut a piece of 18 gauge wire to 6” long. I’ll call this the core wire. Cut a piece of 26 gauge wire to 24” long. Wrap the thinner wire around the core wire seven times. Make a bend in the wire at about 3/8” from the core wire. Slide a star into the bend. step 6 - Grasp the bend in the wire with pliers and twist the work 4 or 5 times to secure the star. Wrap the wire around the core wire 7 times. Create another bend. Add stars and wire to the core wire in this manner until all but about an inch of the wire is wrapped. step 7 - On the ends, simply wrap the wire 4 or 5 times around the core and cut off the excess. step 8 - Bend the joined wires around an object like a marker to create the spiral. step 9 - Loop one end of the core wire with round nose pliers. Before closing the loop completely, slip on three stars. step 10 - Insert the clay into the spiral with the clay hole and straight core wire on the same end. Poke the core wire through the hole in the top of the clay. Bend it into a loop with round nose pliers. step 11 - Finish the project by attaching an earring wire through the loop.